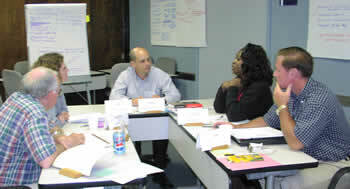 I offer customized training on strategy formulation, the strategic planning process and research techniques. My latest focus is on Thinking Strategically for executives who will rise to the Senior Director or VP level. From the fundamentals (Porter, value chain analysis, industry forces, market analysis) to best practice (team building, decision processes, increased flexibility, planning for dynamic markets). This website is our text and many of my training engagements move into facilitation assignments. People work with you when they know you. I can also provide experienced practitioners who train teams on organizational development, supply chain mangement, complex financial analysis and valuation.